Malia Obama appears to be settling in just fine at Harvard. 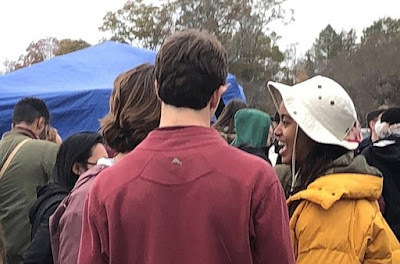 On Saturday, former President Obama's eldest daughter was caught making out with a handsome fellow Crimson fan at the annual Harvard-Yale game. Yale hosted this year's face off, which saw Harvard students decamping down to New Haven to tailgate at their rival's campus before the game. 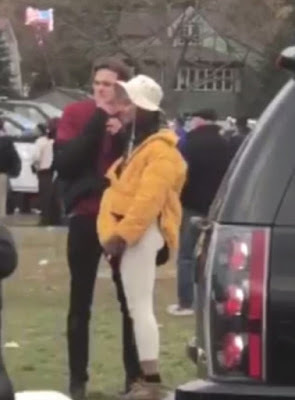 The 19-year-old former first daughter, who took a gap year before starting at Harvard this fall, was seen locking lips with a mystery man at the festivities outside of the Yale Bowl. 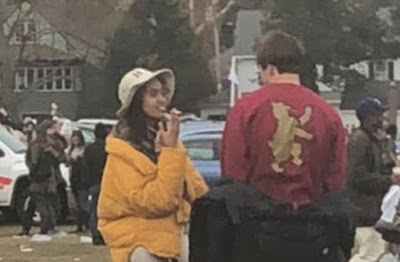 Another photo shows Malia smoking a cigarette during the tailgate - a sign that she may be picking up her dad's old tobacco habit. The man she was snapped kissing wore a black jacket, a red long-sleeved Harvard t-shirt, black jeans and black sneakers.